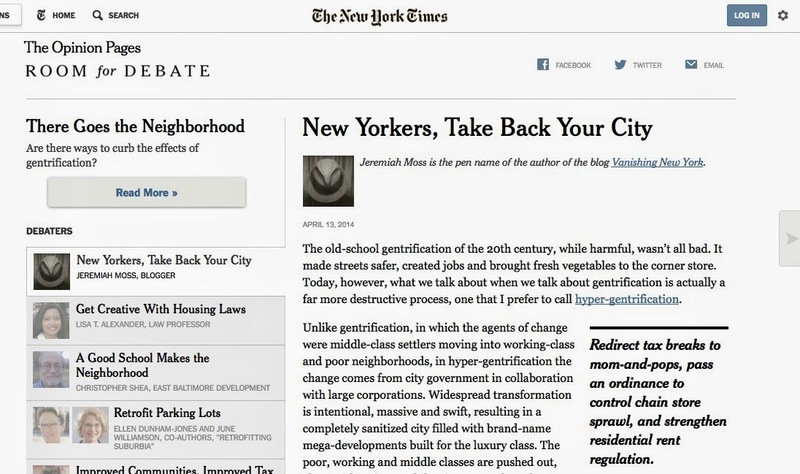 The New York Times' "Room for Debate" asked me to participate in their discussion on gentrification and what can be done about it. Great and accurately disturbing statement. Thanks Mr. Moss. Will send link your link around yet again. Or, you could upzone all neighborhoods, repeal or means test rent control, and limit historical landmarking and make the city affordable for people again, by making housing available that normal people can, you know, actually rent. You’re only protecting insiders at the expense of outsiders, the old at the expense of the young, parents at the expense of their children who wish to move out but stay in the city. You're encouraging politicians to buy votes via more overpriced subsidized housing in a city where 60% of all rental housing is already subsidized by one party or the other. Agreed that developers don’t need tax abatements, but I don’t agree that anyone should have a tax break. Rent regulation recipients don’t pay their fair share of imputed property tax, and that has to be made up by others. Also, why do single-family homes receive preferential tax treatment over denser apartment buildings or condos? The basic problem is that more people are moving to NYC every year than there is housing being built for them. At least Bloomberg recognized that industry wasn’t coming back in many of the areas he rezoned for development, producing new housing. If rezoning didn’t occur, the higher-income residents would just be displacing existing residents elsewhere. We need more development, more condos, more upzoning, more more more. That's the only way things will get cheaper. big differene between rent control & rent stablization. rent "control" can be the same rent from 1962. some people have huge fancy apts for only several 100 dollars. "stablization" means the rent goes up when you resign the lease (different % for 1yr 2 yr 3 yr). some people have had those places for years, they are affordable even for poor seniors. newer market rate rents are not affordable for most people even if it is stablized. no NYC is not just "changing". this is not normal! but it is all over the world, its a global corp thing. the same corps who build malls in central america build them in NY. same people build the skyscrapers. dont know how much power the new mayor has. dont think he cares much anyway. hes also just a fish in a world wide pond. so much of the world looks the same now. good read, well said. this is way beyound change. A policy of "more more more" would be worse than what we have now. It would decimate quality of life and destroy the city's past forever in the vain hope of making a place for everybody who wants to live on what is already one of the most overcrowded cities in the world. It's a glibertarian pipe dream anyway because rich property owners who care about their neighborhoods would never allow the kind of upzoning that would be needed to make a dent. There's a reason the most business-friendly supreme court in history has gone nowhere near striking down land use regulation: rich people like it. Frankly, there's no satisfying answer to the problem of gentrification. New York is a "winner" in the global sweepstakes of our winner-take-all economy: the rich and upwardly mobile want and need to be here and will spend any amount to buy or rent a piece of it. New big buildings, designed by computer to maximize efficiency, will never feel as human as old ones. To banks and landlords, increasingly indistinguishable, national chains are always better propositions, financially, than mom-and-pops. 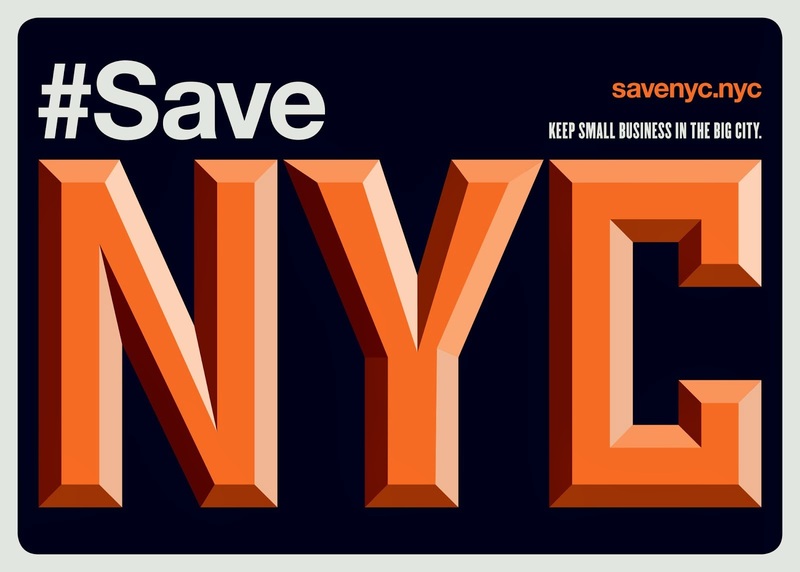 The old New York that created our beloved institutions now gasping their last breaths was a working-class city, and that class has long since vanished, replaced by the 1% and its vast army of servants.